Knock Murton is one of the fells that sit above Cogra Moss, forming part of a perfect minature mountain landscape peaking at Blake Fell. Knock Murton is a steep grassy fell, lacking major paths. At one point the lower parts of northern and eastern slopes of the fell were both covered in conifers, but the northern plantation has now been felled. The eastern slopes are still tree lined, and I rather like the short stretch of forest track at the south-eastern corner of the fell. Knock Murton is a fantastic viewpoint for the west Cumbrian plains and the Irish Sea. There is also a glimpse of Ennerdale Water with Crag Fell beyond, and along the ridge between Ennerdale and Buttermere, but the best fell view is the view across Cogra Moss towards Blake Fell, which is seen its most impressive, from the lake, through the tree lined lower slopes and up to the crags that line the upper reaches of the fell. The Ennerdale Show is currently held at The Leaps, the field to the south of Knock Murton, so the fell is part of the backdrop to events. The northern and eastern slopes are rather too steep to climb. The western slopes are the easiest, and they are best approached from the south-west. There is roadside parking on the road here and an old mine track runs along the foot of the fell. Paths run up the south-west corner of the fell (presumably used by the fell runners). These are steep at first, but soon reach the gentle slopes that run west from the summit. The fell can be approached from the small car park at Felldyke, using the track that runs up to Cogra Moss, but it is quite tricky to get from the Forestry land to the open fell, so the south-western approach is better. There is a path running east from the summit - this drops down the steep eastern slope and enters the forest where there is a clear but very steep path that eventually emerges on a path that links the lower and upper forestry roads. Knock Murton has a grassy double summit - the western summit is the higher of the two, and is topped by a number of cairns including one large odd shaped pile. In the south Hare Gill rises in the grassy area between Low Pen and Godworth and flows west towards Knock Murton. As it passes the fell it ebcomes Leaps Beck (The Leaps are the fields to the south of Knock Murton, and now the venue of the Ennerdale Show). After flowing past the fell Leaps Beck turns north-west and becomes Smaithwaite Beck. 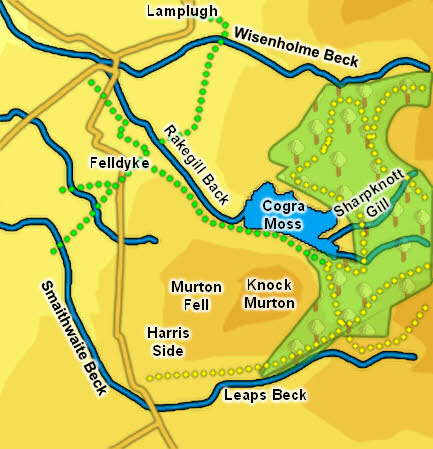 Cogra Moss sits at the foot of Knock Murton, below the steep northern slopes. This is a reservoir that replaced a swamp (the original Cogra Moss), but despite this is a very attractive sight in its bowl in the hill. This was once a heavily mined area. The fields south and west of Knock Murton are filled with the remains of the vast mines that were once here, and there are mine shafts and other workings dug into the steep southern slopes. The fell races at the Ennerdale Show all use Knock Murton, with the younger runners staying on the lower slopes while the older runners and the trial hounds reach the upper levels of the fell.